Back before the internet us elders had to know what music to buy from either the radio, magazines, MTV, word of mouth, tape trading or seeing bands live. On more then a few occasions you'd gamble and buy an album based off of artwork or the name, you'd go home put it on and more times then not, be thoroughly disappointed..not this time. Shroud Eaters latest full length Strike the Sun is the first LP they've given us in a few years but its well worth the wait. 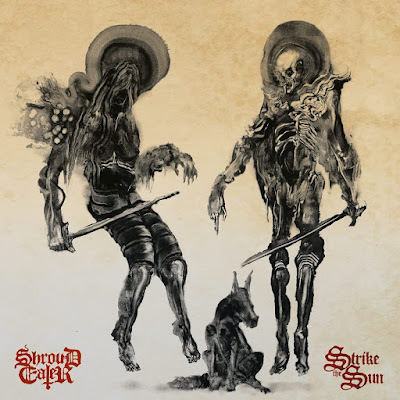 This albums artwork and songs are shrouded in an evil cloak of heaviness and sonic beauty that with hard work and dedication to their craft have yielded great results thus catapulting them into the realm of Doom juggernauts, there's allot more here musically then just the typical drone riffs and having more then one vocalist really keeps things interesting, this doesn't always work for me with some bands but with Shroud Eater its a welcome . Catch these Floridians in there home state for the record release party, August 18th at Gramps in Miami. Out on STB July 7th Digitally and July 8th at Noon on Vinyl. Links below for songs and where you can buy!